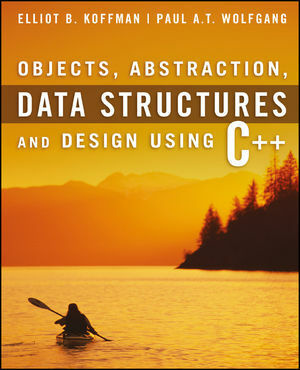 Koffman and Wolfgang introduce data structures in the context of C++ programming. They embed the design and implementation of data structures into the practice of sound software design principles that are introduced early and reinforced by 20 case studies. Data structures are introduced in the C++ STL format whenever possible. Each new data structure is introduced by describing its interface in the STL. Next, one or two simpler applications are discussed then the data structure is implemented following the interface previously introduced. Finally, additional advanced applications are covered in the case studies, and the cases use the STL. In the implementation of each data structure, the authors encourage students to perform a thorough analysis of the design approach and expected performance before actually undertaking detailed design and implementation. Students gain an understanding of why different data structures are needed, the applications they are suited for, and the advantages and disadvantages of their possible implementations. Case studies follow a five-step process (problem specification, analysis, design, implementation, and testing) that has been adapted to object-oriented programming. Students are encouraged to think critically about the five-step process and use it in their problem solutions. Several problems have extensive discussions of testing and include methods that automate the testing process. Some cases are revisited in later chapters and new solutions are provided that use different data structures. The text assumes a first course in programming and is designed for Data Structures or the second course in programming, especially those courses that include coverage of OO design and algorithms. A C++ primer is provided for students who have taken a course in another programming language or for those who need a review in C++. Finally, more advanced coverage of C++ is found in an appendix. Elliot Koffman is currently Professor of Computer and Information Sciences at Temple University. He received his Ph.D. at Case Institute of Technology. He has authored and co-authored numerous textbooks and other publications. Paul Wolfgang is currently Professor of Computer and Information Sciences at Temple University. He received his B.S. in electrical engineering at University of Pennsylvania. Chapter P. A C++ Primer. Chapter 1. Introduction to Software Design. Chapter 2. Program Correctness and Efficiency. Chapter 3. Inheritance and Class Hierarchies. Chapter 6. Queues and Deques. Chapter 9. Sets and Maps. Chapter 11. Self-Balancing Search Trees. Appendix A: Advanced C++ Topics. Appendix B: Overview of UML. Appendix C: The CppUnit Test Framework. Data structures follow the C++ Standard Template Library (STL) format. Students are encouraged to use the STL as a resource for their programming. New data structures are introduced by specifying an abstract data type as an interface that is adapted from the C++ STL. The data structure implementations in the text are simplified versions of the STL implementations. Data structures are taught in the context of software design principles. Early chapters present software design concepts, efficiency, and testing; the data structures chapters apply these principles to the design and implementation of data structures needed to solve particular problems. Students gain an understanding of why different data structures are needed, the applications they are suited for, and the advantages and disadvantages of their possible implementations. Emphasis on documentation is provided by using the documentation style developed for Java (Javadoc) which is also applicable to C++ classes and functions. Emphasis on modern C++ programming style. The textbook emphasizes a C++ programming style that facilitates object-oriented programming. The text begins with an extensive primer on C++ that would be very useful for someone who has previously studied Java or needs a C++ refresher. Unlike earlier data structures books in C++, this text emphasizes a programming style that supports object-oriented programming, beginning with a discussion of classes in Chapter 1 and class hierarchies in Chapter 3 which is carried throughout the book. Sections of primary interest to Java programmers would be Section P.5 which focuses on objects, pointers, and dynamic allocation, Section P.6 which discusses call-by-reference parameters, Section P.7 which discusses arrays and how to access static and dynamically allocated arrays through pointers, and Section P.9 which discusses input/output streams. Show how to use them to access elements of lists and other STL data structures and also to access array elements. Use iterators in the sorting chapter (Chapter 10), so that the sorting functions in this chapter will be able to sort the data in several STL classes in addition to arrays. For example, the selection sort function in Section 10.2 (p. 575), the merge sort function, Section 10.7 (p. 592). Ch 2 introduces program correctness and efficiency by discussing exception and exception handling, testing strategies, and has brief coverage of big-O notation.